This classic combination turns out to be an pretty good snack. The key is to use real cheese (not processed cheese such as Velveeta) and low calorie crackers. Crackers that have just wheat flour and water are all you need to munch on. 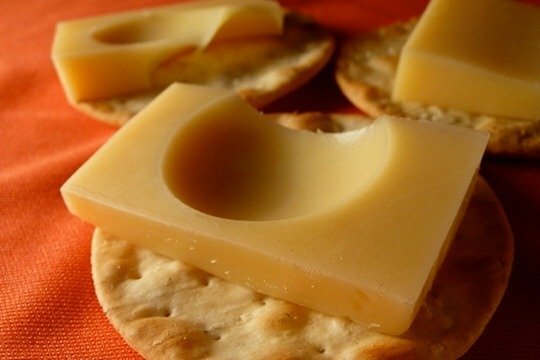 Avoid pre-packaged cheese and cracker products if you can. They don't include real cheese, but a combination of oil, milk derivatives, artificial flavors and colors. Usually these products don't have to be refrigerated - which is a clue to you that they aren't real cheese. The cheese and crackers in the photo are Jarsberg and water crackers. This is probably the lowest calorie combination for cheese and crackers. If you chose Ritz crackers and cheddar cheese you would be eating about 194 calories (or a third more). The choices are endless with cheese and crackers. If you are watching your weight, you want to stick with a strong tasting cheese. A blue cheese has about 100 calories per ounce, but you will almost NEVER eat more than an ounce. A softer cheese such as Brie, will set you back 100 calories per ounce, but it is so delicious. It may be worth the extra calories to get the satisfaction of eating yummy cheese. Don't be afraid of trying new cheeses. If you are lucky enough to have a cheese store near by, the owners love to give out samples to help you choose a favorite. This can be a life altering experience. And it doesn't have to be expensive because you can buy very small amounts. Kids love both cheese and crackers. Sneak a slice of apple or strawberry on the cracker to give them a more nutritious snack. You can have them make "cheese and cracker sandwiches" with a few plates of things like raisins, apple slices, grape pieces, cheese slices and graham crackers. Almost any food kids make themselves will end up in their tummies. yummm... I LOVE cheese! I love sharp cheeses like Swiss, Cheddar, and Parmesan. Of course mascarpone & ricotta are wonderful too.